When a pig farmer reported an animal rights activist for interfering with his property, he likely didn't anticipate that he'd be setting up the entire meat industry to be put on trial. Yet, that's exactly what happened last week when Anita Krajnc pled not guilty to mischief charges for having given water to a pig overheating on the farmer's transport truck. It's hard to credibly dispute that the pig was in distress. An expert veterinarian has already testified that she believed this to be the case, but even if she hadn't, it's fairly clear from the video footage that the pigs were overheating. The industry's own (conservative, outdated) guidelines state: "all species will pant when overheated, animals standing with neck extended with open mouthed breathing is a dangerous situation." The pig Anita gave water to standing with their neck extended, open-mouthed breathing. Crowded, unventilated transport trucks can become very hot, especially on hot days, as this particular day was. Pigs are particularly susceptible to overheating because they can't sweat, which is why in natural circumstances they would spend hot days wallowing in cool, sun-protective mud. Photo: still from Toronto Pig Save video used in court. The case is receiving international media attention -- most decent people recognize immediately that causing animal suffering, not relieving it, is what should be the crime. The twisted circumstances of the case illuminate fundamental animal rights issues: animal welfare laws are inherently both weak and under-enforced; animals are used as commodities, the property of owners whose raison d'être is profit; and our legal and political institutions privilege those with money and power, of which animals have neither. So here we are: the pig's owners minimal interest in not having "his" pig given water without his permission has warranted a trial, while the interests of the pig suffering from overheating -- an animal now long dead and eaten -- have disappeared into the void of business-as-usual. And it wasn't just this particular pig on this particular day. We know that transportation is incredibly stressful and dangerous, that our regulations are considered the weakest in the Western world, and that enforcement is shamefully lax. Our federal agriculture's own data shows that in 2015 -- the year Anita committed her so-called crime -- 14,212 pigs were found dead at slaughterhouses. That means more than fourteen thousand pigs were loaded onto transport trucks alive, and died during the journey. Nobody was convicted of animal cruelty for any of these deaths. That same year, a dog walker was sentenced to six months in prison and a lifetime ban on caring for animals for leaving six dogs inside her truck, where they died from overheating. 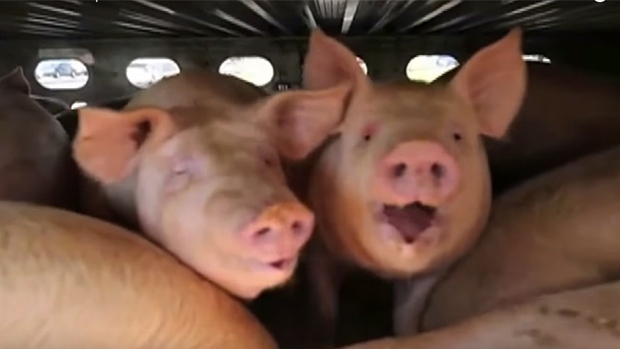 The driver acknowledged that pigs go into distress during transport. The driver acknowledged that pigs disperse heat differently (i.e. they can't sweat, so they become overheated on hot days without water) and that trucks with fans, ventilation, and water misting are available; but he doesn't have this technology on his truck. When the driver got out of the truck to confront Anita, who was giving water to an obviously heat-stressed animal, the driver acknowledged that he didn't even look at the pig to see whether they were in distress. The driver doesn't know about the code of practice guideline to spray pigs with water prior to loading. According to the driver, trucking companies don't follow this guideline. When asked by the lawyer to confirm that the trucking contract requires drivers to comply with federal animal welfare laws, the driver responded that he didn't know: "that is not my department." We killed 20 million pigs last year, and as enormous as this number is, it pales in comparison to the total number of land animals we killed for food: more than 750 million last year alone. Virtually all of them were transported under similar conditions. Why are we only outraged when the victim is a dog and the vehicle is a car?